If you are not familiar with Rolland Paper, get to know this Québec-based paper company. For one thing, unlike many of its competitors within the pulp and paper sector – not to mention many companies across all sectors – Rolland wears its environmental credentials on its sleeve. And Rolland has been far ahead of the curve. Founded by Canadian printer, bookseller, and politician, Jean-Baptiste Rolland, the company traces its history to 1882 and started manufacturing recycled paper in 1989. Just visit its website, and Rolland discusses its environmental performance right away – there is no need to dig deep into the site or to find “sustainability” in tiny letters at the bottom of the screen. Not only does Rolland talk recycled and sustainable paper, it is building on its 136-year legacy as it has become a leading supplier of responsible and ethically sourced paper products. 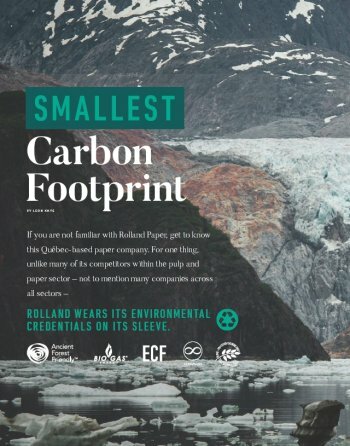 One of Rolland’s customers, Patagonia, has touted the benefits of using the manufacturer’s recycled paper for its catalogs. Rolland’s products have been integral to the outdoor apparel company’s drive to communicate its sustainability agenda to its customers. Among a list of NGOs and other organizations that Patagonia has pledged to support, the company includes Rolland in the list of organizations disclosed to customers as one part of its strategy to product forests. Rolland’s operations help assure its customers that the company is doing everything it can to stand out as a sustainability champion within supply chains. For example, the paper manufacturer says it is the only paper producer in North America that uses biogas energy—and has done so since 2004. Currently, biogas powers 93 percent of the energy requirements needed for its mill in Saint-Jérôme, Quebec. The company’s plant captures 100 percent of methane emissions from a local landfill and diverts that gas along an eight-mile pipeline to the mill, preventing those emissions from entering the globe’s atmosphere. Furthermore, to eliminate landfill waste while conserving energy and water, the company recovers what the industry calls “short fibers” during the paper manufacturing process. Rolland sells those residues to farmers, who in turn use them as grass seed coating or animal bedding. For example, the company says it has been a long-time donor for the Saint-Jérôme Hospital Foundation, and Rolland’s supply chain director Marc Charbonneau is president of the hospital’s board. Yardley make it clear during the interview that supporting education and youth programs in the community is important to Rolland. Most recently, the company donated paper to the Rivière-du-Nord School Board’s Science Challenge and sponsored local sports organizations for kids. That future for those employees is tied to the continued viability of the pulp and paper industry. Yardley pointed out what she said are myths perpetuated about paper consumption. “One thing that we always hear is that paper is not environmental friendly, and that going digital, or ‘paperless,’ is better,” she said. But Yardley counters that argument saying any message such as “going paperless saves trees” is often misleading because it links paper to deforestation. One result is that those forests can continue one of their most important roles: The sequestration of carbon. In North America, the paper industry has encouraged, and depended on, various sustainable forest management practices that result in the growth of billions of trees annually. By developing and strengthening the market for responsibly grown pulp and paper, the industry says it has motivated landowners to keep ownership of their lands, instead of selling them for development or other non-forest uses. And as more paper becomes recycled and displaces the virgin pulp which, as Rolland reminds us, is already responsibly sourced, the company views itself as becoming an even more efficient operation in the coming years. Rolland will discuss this in its upcoming sustainability report scheduled for release this fall. Companies that have embarked on strategies similar to that of Rolland could very find themselves in a unique position: As demand for their products grow, their environmental footprint could decrease in size. The results are a win-win: More recycled content that allows Rolland to manufacture its coveted products, while its mills can still contribute to local, vibrant, sustainable economies. Read more stories from CR Magazine here.